In Weirdos Like Me, Donna plunges the reader into a world of surrealism satire, wonder, substance and reflection as she dissects today's critical social and political issues and leaves us reunited with the spiritual ones. 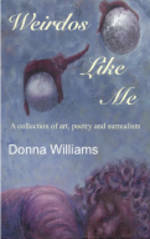 Ranging from surreal, to grungy, from romantic, to funny, from political to symbolic and everywhere in between, Weirdos Like Me is a 240 page collection of poetry, art and surrealism. Half of the book is artworks making the book an art book as much as a poetry book. Amidst the poetry and paintings are also the wacky and wonderful song lyrics to songs she performed with The Aspinauts. THIS BOOK IS AWAITING A PUBLISHER.